So how did the turkey bounce back? The answer lies in what some consider America’s greatest wildlife conservation success story. When the first European settlers arrived in the New World, it was noted that turkeys were both a common sight and a readily available meal. That’s perhaps why European colonists considered turkeys an unlimited resource, hunting them without restraint and destroying habitat by logging and clearing the forests that turkeys and other wildlife use for roosting. This activity continued over centuries. 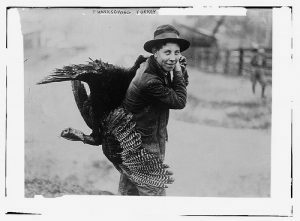 By the early 1900s, turkeys had been eradicated from 18 of their native 39 states. It was believed that the American wild turkey would disappear altogether. Learn how early conservationists saved the American wild turkey from near certain extinction. Fortunately, the American conservation movement had just begun at the turn of the century. The movement was catalyzed by conservationists including Theodore Roosevelt and George Bird Grinnell, who were concerned about natural resource losses resulting from logging and hunting – both activities driving turkeys to the brink of extinction. Decades before the Endangered Species Act became law, these conservationists rallied for government to protect and recover wild turkeys. The Forest Service was established. Protected areas were created. Game laws were passed and enforced. In addition to policy efforts, citizen conservationists stepped up, protecting habitat and funding turkey reintroduction efforts. By 1952, bird numbers nationwide slowly inched up to 320,000. 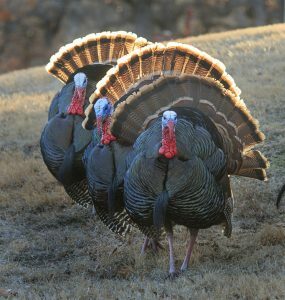 By the 1970s, organizations like the National Wild Turkey Federation were working closely with state and federal agencies to ensure a full recovery for the wild turkey population. One activity that proved particularly successful was trapping wild turkeys in areas where they were already thriving and reintroducing them to other areas with suitable habitat but fewer birds, such as reforested areas. These new local populations quickly established themselves and birds began showing up in places they hadn’t been seen in a century. Today, hunters can enjoy the experience of walking through the woods and seeing the birds, hearing their gobbles, and finding where they scratched for acorns and insects. 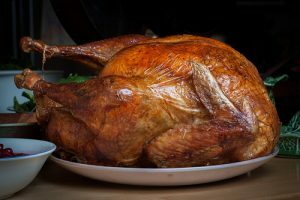 Many hunters across the country even harvest their own wild turkey for their Thanksgiving meal, rather than purchasing a Butterball from the grocery store. This Thanksgiving, as you gather around the cornucopia, consider sharing the uplifting story of the American wild turkey’s recovery with your family and friends. Ultimately, it is story of cooperative conservation – of hunters, scientists and conservationists all coming together the save a species. The seven million wild turkeys strutting across all lower 48 states and Hawaii today are a testament to foresight, innovation and success of America’s early conservationists. This entry was posted in ecosystems, Endangered Species Act, Wildlife Protection and tagged American wild turkey, bald eagle, conservation, Endangered Species Act, endangered species act success stories, forest service, hunting, National Wild Turkey Federation, Thanksgiving, theodore roosevelt, turkey, wildlife. Bookmark the permalink. Both comments and trackbacks are currently closed. If you ever ate a wild turkey you would understand why the Indians brought fish to the first Thanksgiving.